The industrial visits act as a value-added learning method for management students. Learning from textbooks, lectures and other study material does not suffice for holistic learning. Practical, hands-on learning is essential for better understanding of work processes and business functions. Industrial visits give greater clarity about important management concepts, as students practically experience how these concepts are put into action. Keeping these views in mind, DMS plans number of industrial visits for their students in various companies which help them gain hands-on experience of how industry operations are executed. INDUSTRIAL VISIT AT BUNGE INDIA PVT LTD. 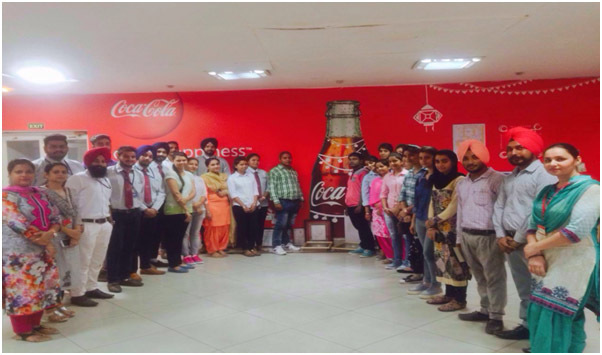 The Department of Management Studies has organized its second Industrial Visit at Bunge India Pvt. Ltd, Rajpura on 29th September, 2014, an ISO 9001 and HACCP certified company established in 1880 by J.P.J Bunge. During the two hour session, the students got an opportunity to interact with Mr. Vipin Mehta, Assistant Manager, HR, who gave the brief introduction about the company and the core values on which the company works. He told that Bunge focuses on five core values which include teamwork, Openness and Trust, Integrity, Entrepreneurship and Citizenship behaviour. He addressed the students about the policies and procedures followed in Bunge for the recruitment, selection and training of the employees. He also discussed with the students the various product lines of the company in which it deals such as Vanaspati, Dalda, Chambal, Ginni and Amrit. He also added that the Rajpura Unit of Bunge is the first unit that is using SAP for the logistics since 2000. The company has its own power generation plant which operates through rice husk that is highly cost effective. Mr. Mehta further added that the safety, health and welfare of employees is of prime importance for the organization. In order to motivate their employees, they have undertaken various activities such as free health checkups, blood donation camps, scholarship schemes for the wards of employees. In addition to the above, the company provides gifts on various occasion such as Diwali, Birthday’s, New Year etc. Due to the various benefits offered to the employees, the attrition rate is almost negligible which tends to make Bunge India Pvt. Ltd. as the employee centred organization. Coca-cola India, is one of the country’s leading beverage companies, offering a range of healthy, safe, high quality, refreshing beverage options to consumers. Kandhari Beverages Pvt. Ltd. is leading manufacturer of cold drinks in North India. Its headquarter is in Chandigarh. Kandhari beverages pvt. Ltd. also setup its plant in village. Sadhugarh distt. Fatehgarh Sahib. The plant earlier was setup in 21 acres which later expanded to 28 acres. The plant has Asia’s fastest line of 750bpm, which means the machine packs 750 bottles in one minute. The plant in village Sadhugarh was established in 2001. The visit of MBA students at the plant was bery beneficial as the HR executive Mr. Lovy Singh guided students about the process and functioning of the machines. The plant mainly manufacture coke, fanta, thumbs-up, juices. The students were allowed to see all the steps involved in making bevereges from filteration of water to the final step of packing of beverages. The plant’s HR executive also planned an intraction session for the students in which students asked their queries. The staff of the plant was very coperative and the industrial visit to the plant was knowledgeable. 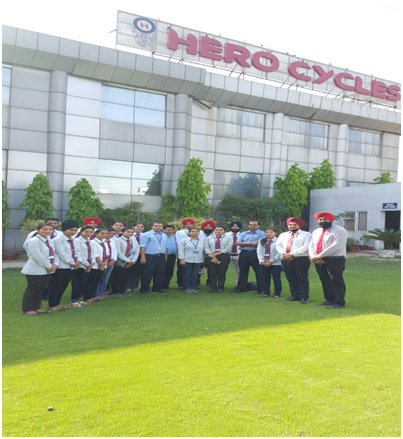 The Department of Management studies of Baba Banda Singh Bahadur Engineering college, Fatehgarh Sahib organized industrial visit for its MBA students to worlds No 1 cycle manufacturing company “ Hero Cycle Ludhiana” on 16 April 2016.Hero Cycle limited is totally a manufacturing unit started by the renounced industrialists Munjal Brothers back in 1956. 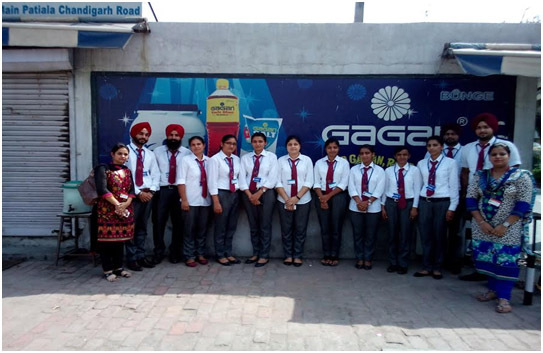 J.C.Verma, Head, Human Resources, of Hero Cycle Ludhiana addressed the students about history and functioning of the plants manufacturing processes right from acquiring raw material to finished products. Demand of the cycle in today’s era is increasing day by day because of being environment friendly vehicle and also helps body to maintain fitness level. Hero cycle Ludhiana plant name was recorded in “Guinness book of world record” for its recorded monthly production of 6 lakh cycles. Queries of the students regarding plant were answered by J.C.Verma. Such visits enable the students to bridge the gap between theoretical training and practical learning in a real-life environment. The students are able to better identify their prospective areas of work in the overall organizational function and become more aware of industry practices and regulations during such visits.